The above shortcode contains only the “image name” in the post content. 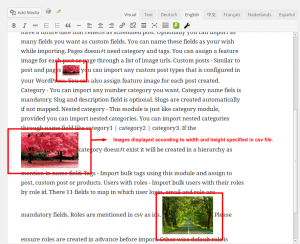 To display an image in the WordPress site the above line is added in the post content of the CSV file. The only drawback is the image is displayed with the automatic width and height. We cannot change the size of the image in the version 4.1. But the WP Ultimate CSV importer PRO version 4.2 has little bit changes in the structure of shortcode. Here we added some features that we can change width and height of the image using the following shortcode. The new features added in the shortcode are “width,height and alt” . So we can change the size of the image in the WordPress site. In the older version(4.1) it is not possible to modify the width,height of the image in the front end of the WordPress site. But in the version 4.2, we can display the images with different width and height for different images by specifying the width, height in the post-content of the CSV files.